For details about publishing notices (advertising) in the Business Gazette, see the general information page. 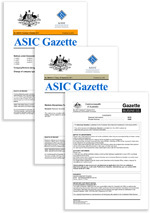 Please note: Many notice types are no longer published in the ASIC or Business Gazette but on the Published notices website at insolvencynotices.asic.gov.au. Two types of gazettes are available for download. The Commonwealth of Australia ASIC Gazette and the Commonwealth of Australia Business Gazette, which are published weekly every Tuesday (except for the first and last weeks of the year). Special editions of gazettes (including unclaimed money gazettes) may be published as required. If you wish to be notified by email when a special edition is published you can subscribe to our Alert Service. Gazettes published on this site will remain archived on this site. The gazettes can also be viewed in libraries that participate in the Library Deposit Scheme. Unclaimed money gazettes are published as required. See the contacts page for inquiries about specific notices. Private company notices advertised by companies under the Corporations Act 2001. Not all notice types are published in the Business Gazette. For details, see the general information page. Search for unclaimed money from banks, building societies, credit unions, life companies, friendly societies and registered Australian companies. All the information in unclaimed money gazettes is incorporated into our Unclaimed Money Online Search. For more information go to our consumer website, MoneySmart. The content of an infringement notice issued by the Markets Disciplinary Panel is prescribed in Part 7.2A of the Corporations Regulations 2001. ASIC may publish details of the infringement notice under Regulation 7.2A.15 and may include any other information that ASIC considers necessary.